Chef Evan Hennessey offers innovation in both cuisine and experience. : Chef Evan Hennessey is known for his avant-garde leanings, which he learned while working with Grant Achatz at Trio as well as with Thomas Keller. His modernist cuisine can be sampled at his restaurant on the third floor of a renovated riverside mill building. In addition to a seasonal four-course prix-fixe menu available Tuesday through Saturday at the six-seat kitchen table, other dinners offered monthly present a delightful immersion into a theme. Guests pay one price for a five- or six-course meal paired with eclectic wines or in some cases beer made by local brewers (they'll even create beverage pairings for those who don't want to imbibe). Sit at the kitchen table where you can watch the chefs prepare dishes with meticulous care right down to petals placed one by one with tweezers onto a plate. Equipment includes a bank of induction burners and dehydrators, but not all the food is filled with powders and foams. 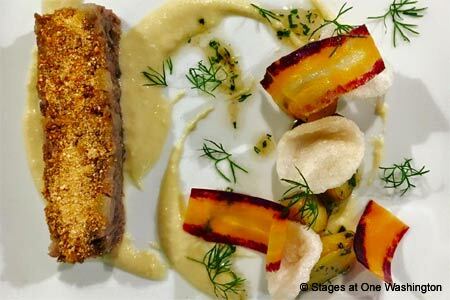 A recent theme celebrated the cuisine of Delmonico's in the 1800s, with dishes like consommé with a crystal clear broth and a light and creamy onion custard. Lobster à la Wenburg, 1876, was a nod to the history of lobster Newburg with a rich lobster sauce; and the Delmonico steak, 1830, was aged in-house for 31 days and served with delicate pommes Parisienne and a classic sauce au poivre. Dessert might be a modern take on baked Alaska. At each dinner, the small dining room is transformed to meet the theme.